Page 26 is up. We return to the Harp & Trumpet where Jassart gets himself in trouble. Just a reminder, we do have a Facebook page and a Twitter feed. Brittany loves to tweet so you’ll get a stream of conscious thoughts from the artist. I highly recommend it. I make announcements on Facebook so it’s a great way to stay up to date. 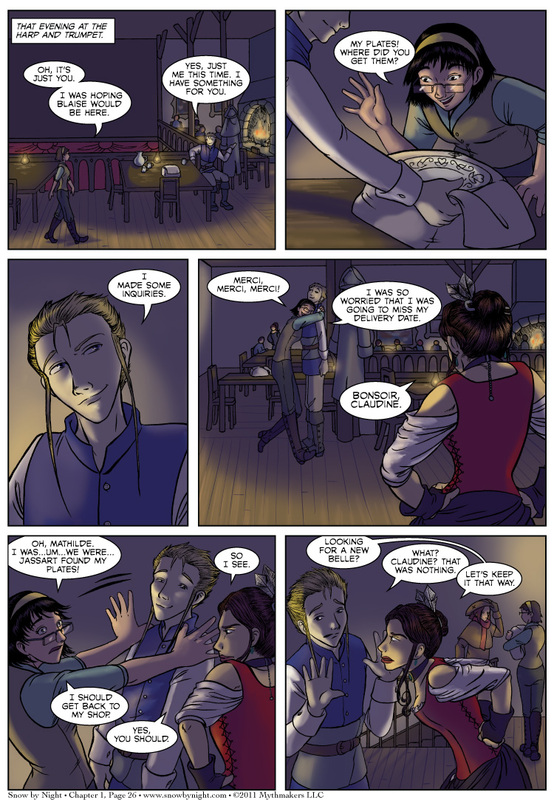 Aaaaand, I’ve uploaded a preview of Page 27 as an incentive on Top Web Comics. Please vote for Snow by Night. Aww Claudine… I think she’s lonely.